How Far is Palm County? Palm County by Vinayagar is a plotted community on the Parawada-Atchutapuram Road, Visakhapatnam. One of the fastest developing residential corridors currently surrounded by Steel Plant, NTPC, Various SEZ's, IT Parks, Apparel Parks, Hospitals, Educational Institutionsa and various other developments. Spread over 18 acres of sprawling greens, Palm County offers you various plot sizes. Situated off Achutapuram-Parawada Road in Visakhapatnam lines a delightful, hidden gateway, an oasis of wide open spaces, so you don't miss the pulse of the city. Palm County is he ideal gateway for nature lovers...An absolute gem of a destination. Close Proximity to Vizag Steel Plant, NTPC, Apparel Parks, IT Parks, SEZ's, Hospitals, Educational Institutions. 40 Mins Drive From Vizag. Close to Proposed International Green Field Airport. Close to Proposed Petro Chemical Corridor. Vinayagar till date has built more than 8,97,823 sft and another 5,12,640 sft will be ready by the end of 2014. The Directors travel regularly to keep themselves aware of the new technology that is being used overseas and also in design elevations to give a unique look for all their ventures. They firmly believe in giving the best to their clients. The promoters have a very good credit rating both with the Commercial Banks and also with the local private financing firms. They also have a very good image in the Social circles and are know for their commitments and ethics in there business dealing. The group has identified, the IT industry as the next thrust area in the coming 5 years, as Vizag is attracting a lot of IT companies with the Government also focusing on this sector. Vinayagar, is planning to venture by building State-of-the-Art, full furnished, plug-and-work, ready to work office spaces keeping in view the requirements of the IT industry. They have recently hired a professional from the IT industry background, who has more than 20 years experience in India & Overseas, in the infrastructure deployment to address this segment. Vinayagar have successfully completed their first residential layout. This land of 23 acres was acquired in 2002 as they have planned that in coming future, the cost of land within the city limits is no more in the reach of middle & upper middle class society. Keeping in view the growth of the city, Vinayagar, has acquired a prime land abutting the NH5, just 17 kms from the city. 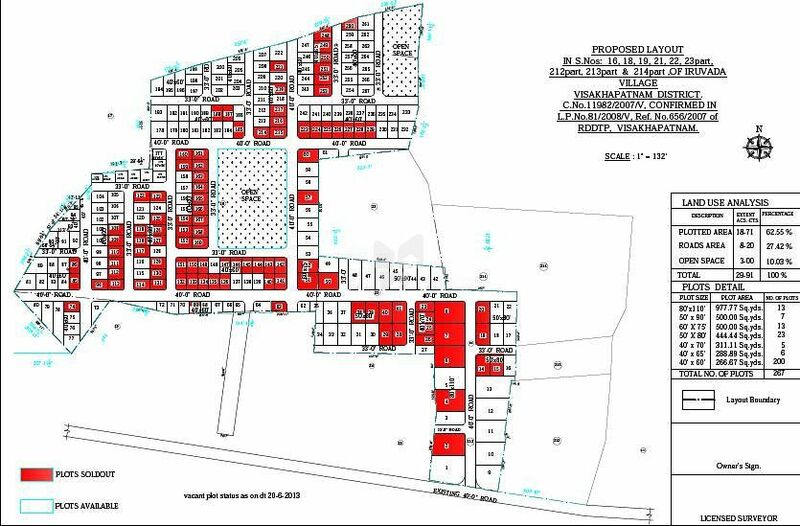 Visakhapatnam Urban Development Authority (VUDA) has approved these plots, which range from 280 sq. yards to 1000 sq. yards. The promoters are in the process of acquiring further properties and also have identified new business ventures in coming years as they feel that Vizag is all set to take off from now with the New Airport.